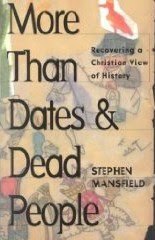 Many a high school student left history class wondering why they were made to study all those dates and dead people. With the present book, Stephen Mansfield argues that there is more to history than they usually let on in most classes on the subject. “History,” Mansfield argues, “isn’t automatically boring. It’s the way we look at it that makes it such agony” (4). In response to those horrific presentations of history, he advances a particularly Christian approach to history which brings it to life to help us understand where we’ve been, where we are, and where we are going. The book opens with a critique of the way history is generally taught in public schools. First, with regard to presentation, Mansfield is critical of the cold and lifeless lists and outlines that characterize so many lectures on history. Second, with regard to a philosophy of history, Mansfield deconstructs the evolutionary perspective which has been adopted by most public schools and affects the way history is presented. In short, history from an evolutionary perspective is meaningless. If everything is an accident, then there is no meaning in it. Why would anyone want to study something that is meaningless? This section of the book is particularly interesting and provides a very basic groundwork for much more work that could be done on the implications of philosophies of history (see here and here). Instead of an evolutionary approach to history, which yields meaninglessness and boring nonsense, Mansfield argues for a Christian approach to history in which history is seen as the outworking of God’s plans and purposes. In this approach, history has meaning because it is created and directed by God. History has meaning because it is the outworking of God’s redemptive plan. History has meaning because it is racing toward a divine goal which defines everything that leads up to that goal. Mansfield lays out four pillars for a Christian view of history: (1) God rules history, (2) God orchestrates history according to how he wants it to end, (3) history gets its meaning from eternity, and (4) history is a battleground between two spiritual kingdoms – God’s kingdom and the evil empire of Satan (22). When Christians study history, we ought to be asking these questions around these pillars. What is God doing in this historical event? How does the spiritual struggle between good and evil fit into this event? What does this event mean in the great drama of God’s unfolding history? Questions like these will bring history to life and cause us to see that history is the place where God is at work…and that is always interesting. The first half of the book rounds off with a section providing tools for doing history. Mansfield suggests that students of history looking into a period of the past study that period’s religion, culture, law, education, and art. Each of these areas provides special insight into what is of the greatest concern to the people the student studies. The last half of the book is comprised of five historical sketches and some bibliographic material for getting started on the journey of reading history like a Christian. The sketches are intended to demonstrate in brief how a Christian view of history works when applied to specific historical persons, events, or periods. The bibliographical information is helpful in providing initial outlets for further study. The book is brief, only 126 pages. It is seems to be written with middle school students in mind. It is not a challenging or intimidating read, though it remains very interesting and very important. The author writes well and with humor. I happily recommend this book to all, but Christian teachers and students of history will benefit from it particularly. It would serve as a fine text for a middle or high school level course.